Slievemore Deserted Village - known for being mentioned and described by Heinrich Böll in his Irish Diary, is a large area comprising remains of around 137 abandoned houses. First settlers came here around 1750, and the last ones left in 1940. It's exciting wandering around and imagining how people have lived here, walked around and put on fire in the open fireplaces of their simple stone houses. 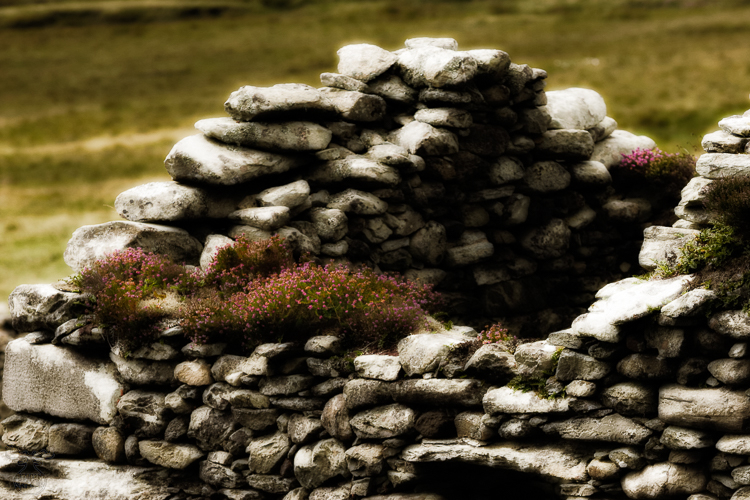 Now only the most resistent parts are left - and new inhabitants - heather, grasses and mosses. Take care of the boggy meadows - I sank in up to my knees once - it was worth it.